This trading strategy course is completely practical oriented and based on real scenarios in NCDEX agricultural commodities market. This module requires you to have basic understanding of technical analysis and derivatives to fully understand and explore the trading strategies discussed here. The trading strategies discussed in the module are your first gateway to the real world of NCDEX agri commodity market and as an analyst or trader. You will be able to build your own strategies as you gain experience. This trading strategy course is completely practical oriented and based on real scenarios in NCDEX agricultural commodities market. This module requires you to have basic understanding of technical analysis and derivatives to fully understand and explore the trading strategies discussed here. 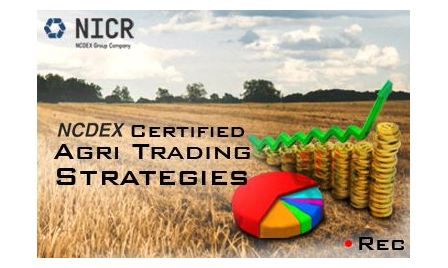 The trading strategies discussed in the module are your first gateway to the real world of NCDEX agri commodity market. You should be able to build your own strategies as you gain experience. Students enrolling for “NCDEX Certified Agri Trading Strategies” will be given a “Certificate of Participation” from NCDEX facilitated by Elearnmarkets, after successful completion of the course. He shall also be given free access to related webinars conducted by Elearnmarkets for further knowledge enhancement. Email query support, Question & Answer community platform will also be availed by the student for any kind of doubt clearance related to content while pursuing agricultural commodities course. All the knowledge content is provided by Elearnmarkets.